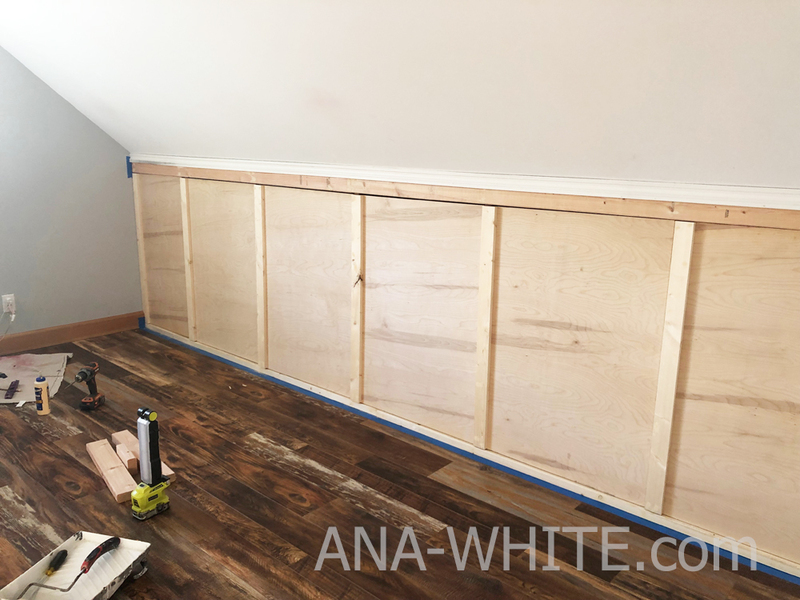 But since I wanted the space behind the knee wall to be accessible for storage, we created hidden doors in the knee wall. 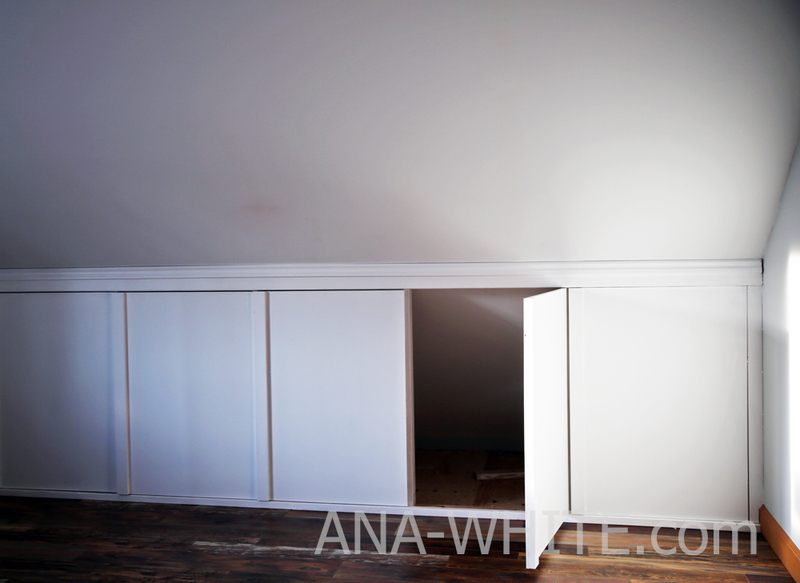 The entire knee wall is actually hidden doors – so the area behind is completely accessible. 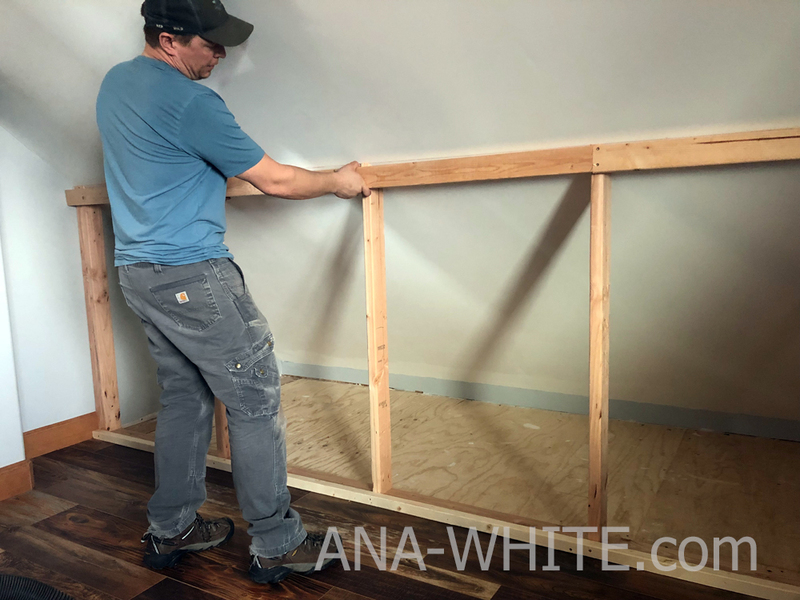 You could take this project a step further and add closet rods and shelving to create a built in closet. We’ll be using the knee wall storage for totes and off season things. First we chalked lines on the ceiling and the floor where the wall is going. 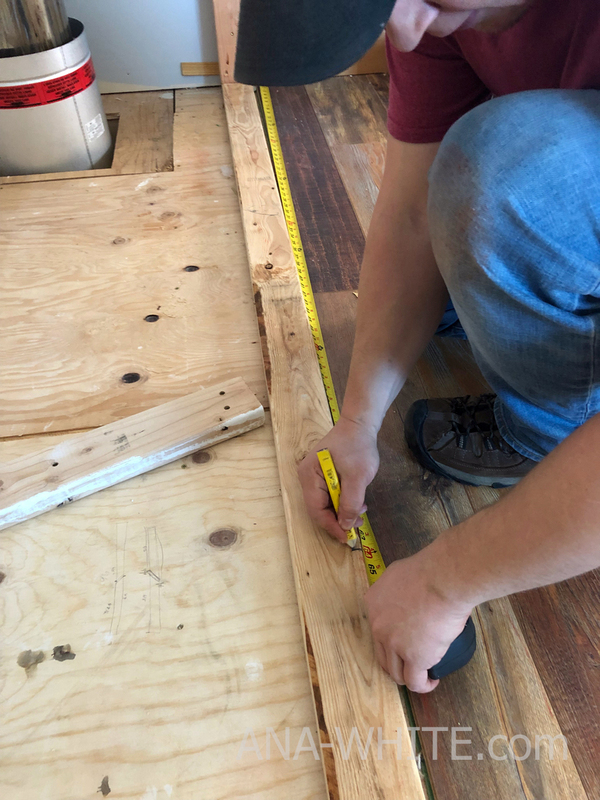 Since the ceiling and floor may be out of square, we used a level and plumb bob to figure out exactly where these lines are. On the floor, we screwed a 2×4 and brought our flooring all the way up to the 2×4. NOTE: You may also need to screw a 1×4 to the ceiling if you cannot just screw into the ceiling. 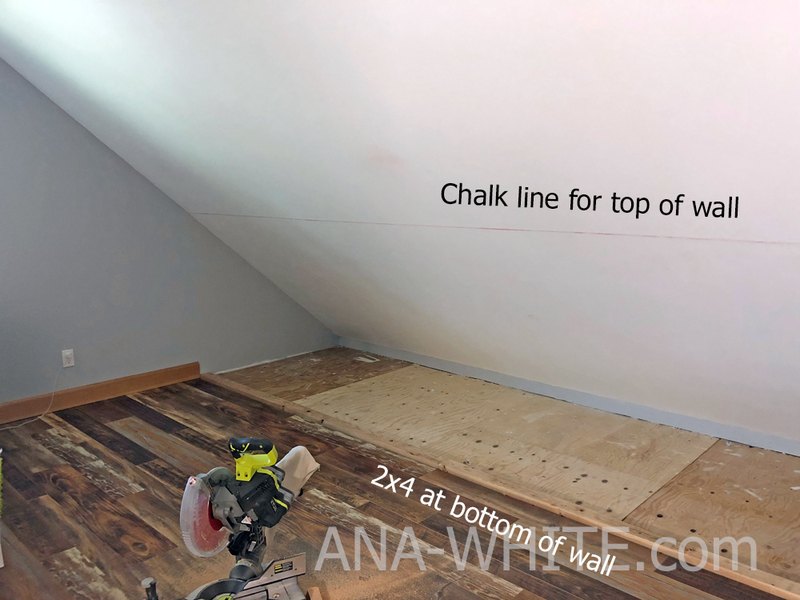 If this is the case, make sure the front edge of the 1×4 does not where the front of the wall will be under the chalked line on the ceiling (you’ll hold it back from the chalked line). From there we measured and cut each 2×4 to fit. 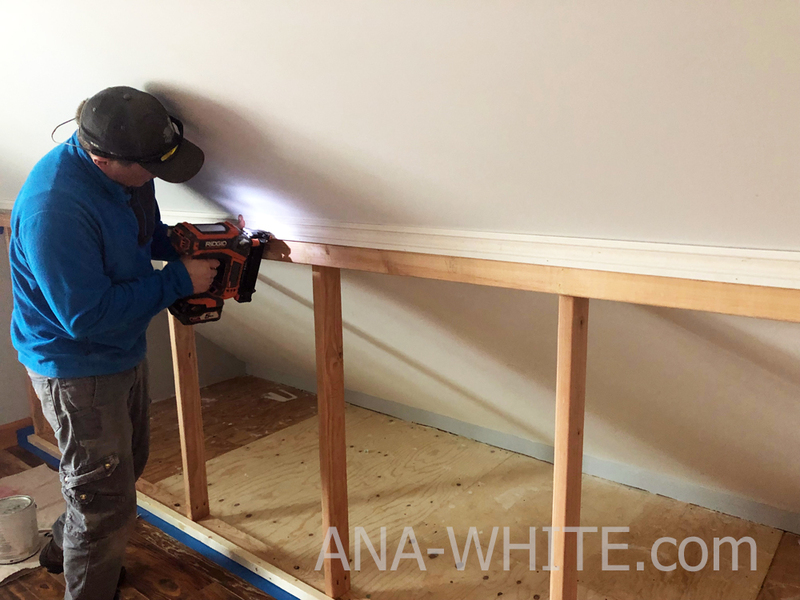 The ceiling sloped from end to end so each stud had to be custom cut. 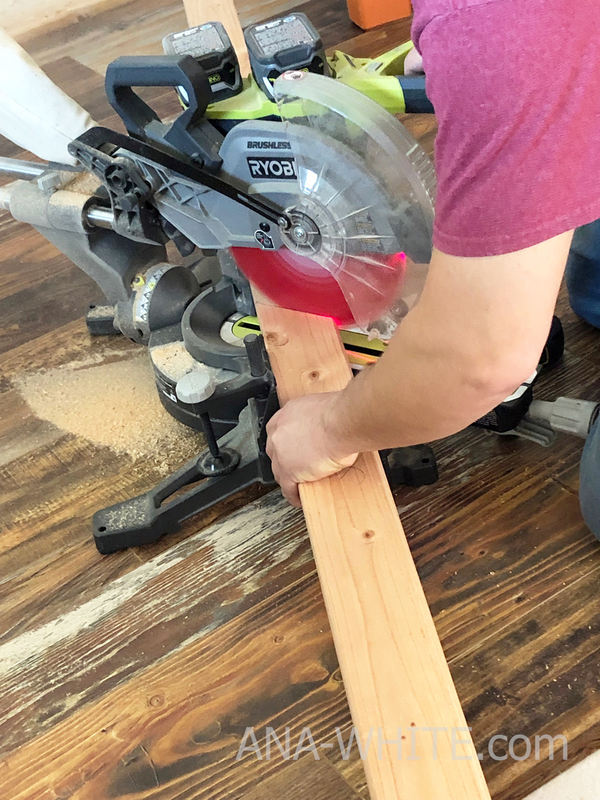 We knew our roof pitch so we just set our miter saw to make this cut. 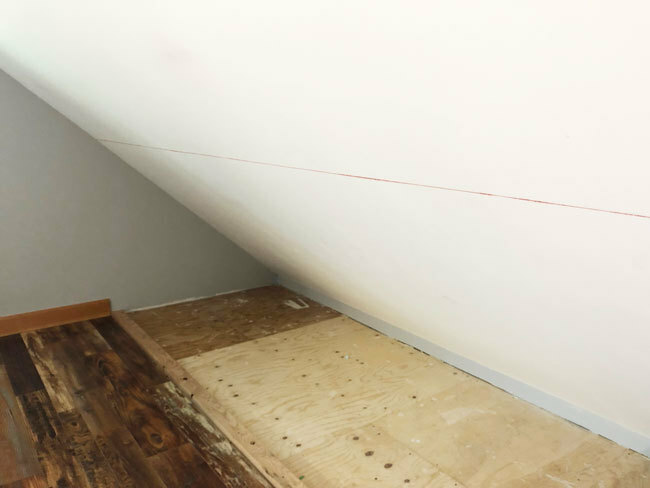 You can use an angle finder to find your roof pitch, or make a pattern and translate that to your miter saw. We then pocket holed the bottom of the studs to the 2×4 on the floor. You can also use wood screws at an angle. We screwed the top of the 2x4s right into our ceiling since we have a SIPS ceiling (OSB everywhere). Then we found the shortest stud, and marked it down 3-1/2″ from the top edge of the 2×4 stud. 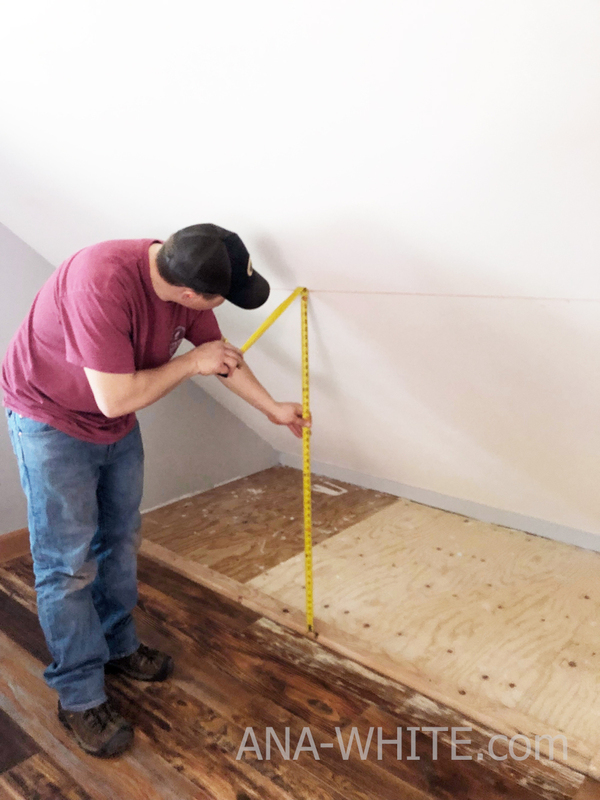 We then measured the space in between – it ended up being right at 44 inches. 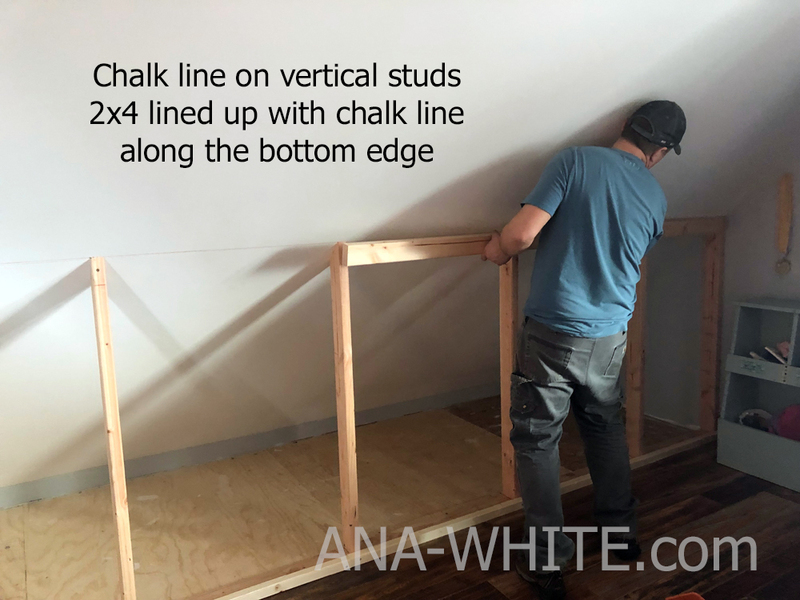 So then we marked the stud on the other end up 44″ inches, and chalked a line in between. Then we screwed 2x4s so the bottom edge of the 2×4 is on the chalked line. Also note we added a 2×2 to the bottom to cover the gap between the flooring and the wall. There is a gap on top of the wall framing that we need to fix too. We finished this gap off with a piece of trim. For the doors, we purchased euro style overlay hinges for FRAMELESS cabinets. 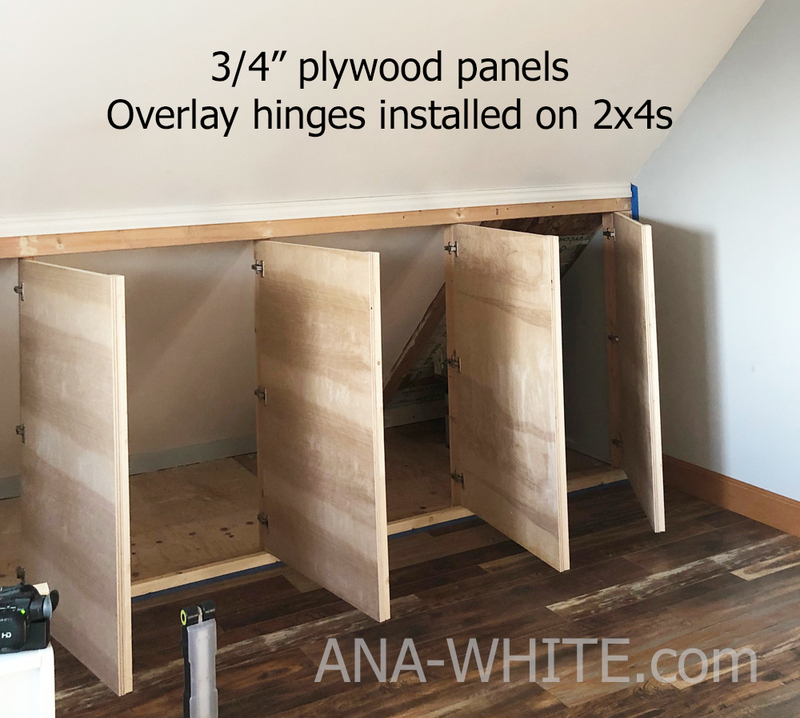 We figured the size of our doors exactly, leaving 1/4″ in between the doors – for our 32″ spacing of studs, this meant our doors were 31-3/4″ wide x 43-1/2″ tall. We cut our doors on a table saw and installed the hinges and hung the doors in the framing. 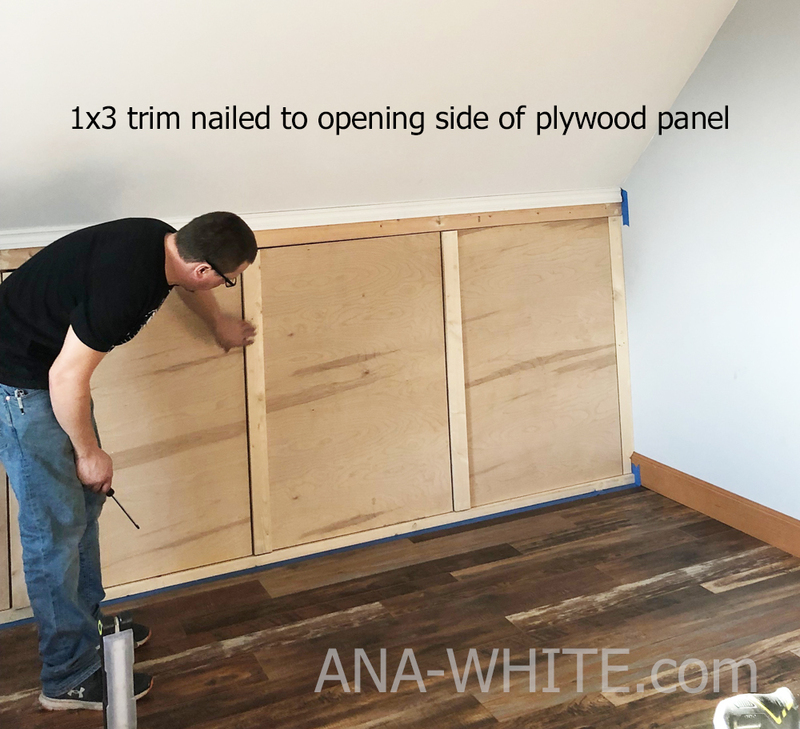 To disguise the door spacing and provide a handle, we nailed 1×3 boads to the opening edge of the plywood door. 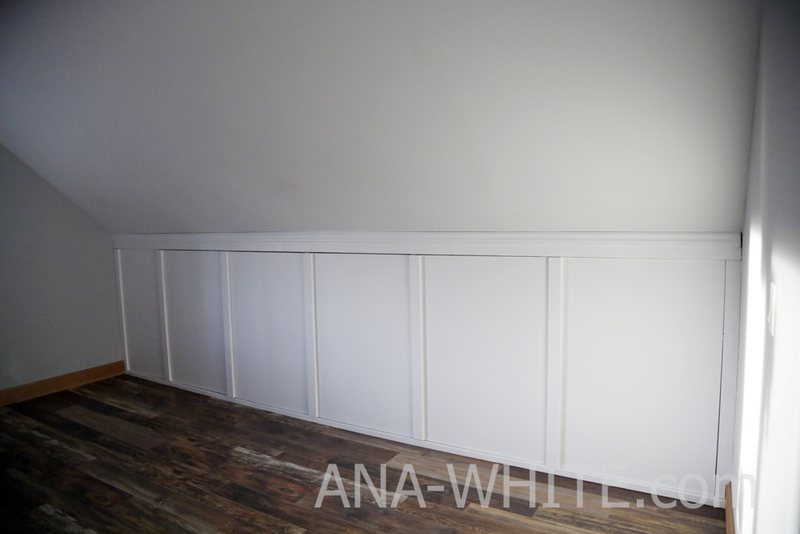 And after paint – We used about a gallon on 32 feet of walls, four feet tall. 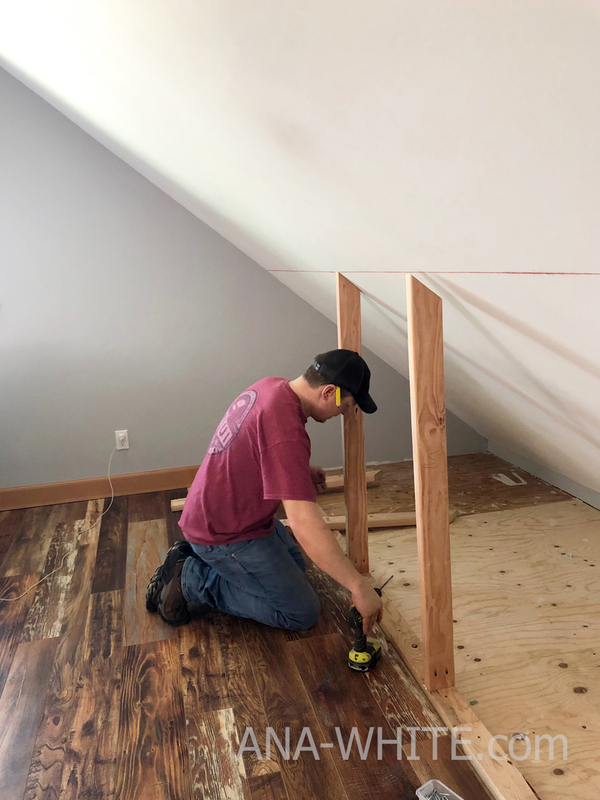 We love how this project turned out and know it will greatly improve the function and look of the room. If you build, please share a photo – tag me on Instagram #anawhite, share to our Facebook page, or add a brag post. We greatly appreciate the support and thank you for using our free tutorials.